In today’s post we introduce you to an easy dish, meaning something that you can make in no time at home after a tough day, but also incredibly delicious and full of Greek flavors. 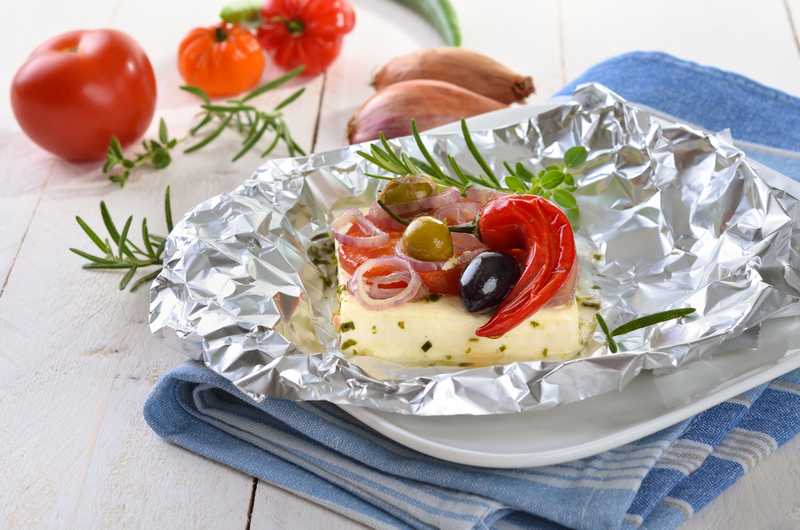 The dish is just Greek feta baked in foil with herbs, vegetables and olive oil. As simple as this dish may seem, it contains a key element that makes it so tasty: baked feta cheese that becomes less tangy and sweeter when baked. No one can resist to this! Prepare four square pieces of aluminium foil. Place on each a slice of feta and distribute equally the rest of the ingredients on top of the cheese. Drizzle with esti extra virgin olive oil. Seal each foil tightly and bake for about 15-20 minutes. This entry was posted in Around the Greek table, THE ART OF LIVING WELL / and tagged comfort food, feta cheese, tradition, vegetarian on 23 October, 2015 by George Papageorgiou.